CD Wow! - FREE delivery! John Ronald Reuel Tolkien CBE (3 January 1892 � 2 September 1973) was an English writer and university professor who is best known as the author of The Hobbit and The Lord of the Rings. He was an Oxford professor of Anglo-Saxon language (1925 to 1945) and English language and literature (1945 to 1959). He was a strongly committed Roman Catholic. Tolkien was a close friend of C. S. Lewis; they were both members of the informal literary discussion group known as the Inklings. 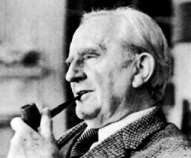 In addition to The Hobbit and The Lord of the Rings, Tolkien's published fiction includes The Silmarillion and other posthumously published books, which taken together is a connected body of tales, fictional histories, invented languages, and literary essays about an imagined world called Arda, and Middle-earth (derived from the Old English word middangeard, the lands inhabitable by humans) in particular, loosely identified as an "alternative" remote past of our own world. Tolkien applied the word legendarium to the entirety of these writings. 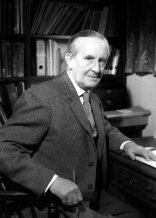 Most of the posthumously published books were compiled from Tolkien's notes by his son Christopher Tolkien. While fantasy authors such as William Morris, Robert E. Howard and E. R. Eddison preceded Tolkien, the great success and enduring influence of his works have led to him being popularly, if perhaps inaccurately, identified as the "father of modern fantasy literature". In any case, Tolkien's work has had an indisputable and lasting effect on the field and related media; many fantasy settings like Dungeons & Dragons, Warcraft, and Warhammer Fantasy owe much of their mythology, directly or indirectly, to him. Tolkien's other published fiction includes stories not directly related to his legendarium, some of them originally told to his children. Copyright © 2019 The Hobbit Fanlisting unless otherwise stated. Layout image copyright © John Howe. This is an unofficial website. The listing was adopted from Cathrine in November 2006. The owner before her was Cassie.